Harper (1922-2007) was a Cincinnati based artist who illustrated lots of books and magazines, but he is probably most recognized for his nature-inspired work for parks and zoos. Unlike realistic wildlife art, his is flat, simple and fun. I love his modern take on nature and how geometric his work is. He was once asked to describe his unique visual style, his response: "When I look at a wildlife or nature subject, I don’t see the feathers in the wings, I just count the wings. I see exciting shapes, color combinations, patterns, textures, fascinating behavior and endless possibilities for making interesting pictures." Isn't his work wonderful? Makes me all warm and happy. Such a great source of inspiration! Totally LOVE! Thank you for the intro! Its got a fifties feel to it which is what I am drawn to about it:) Have a great week friend! Oh I DO love his work! Thank you for sharing it! 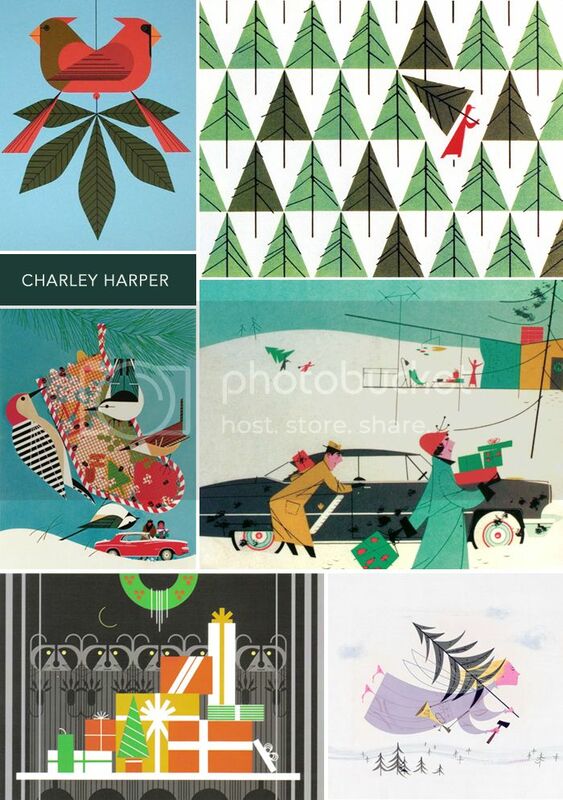 I love Charley Harper!! That illustration of the raccoons drooling over the pile of presents is hilarious! I know! Isn't it cute?! Also love the Christmas tree one... love the simplicity! These are so fun! I love how colorful & happy they are. The purple angel is my fave. Really love them, thanks for the tip!